It all started with a big bang… but then what? Our universe is 13.8 billion years old—the most remarkable detail about this fact is what it implies about its beginning. Space itself is continuously expanding, and winding back the clock shows it getting smaller and smaller, eventually shrinking down to a single point from whence it all came: life, the universe, and time itself. Squeezing the contents of the entire universe into a single point may seem unimaginably difficult, but compress matter enough, and that inward pressure is enough to break molecular bonds into atoms. Compress further and atoms themselves break into their components: protons, neutrons, and electrons. Next, the stress would break even the bonds that tie those subatomic particles together, releasing even smaller particles called quarks and gluons—two of the 13 elementary particles that constitute the most basic building blocks of matter. As carriers of the strong force, gluons are the glue that acts to bind quarks together into protons and neutrons. The strong force governs interactions between all particles with a color charge, like quarks and gluons, and is also responsible for binding together the atomic nucleus. In order to overcome intermolecular and interatomic forces and explore the properties of this primordial cosmic soup, scientists must replicate the conditions of the early universe just milliseconds after the Big Bang, which involved blistering temperatures and tightly packed matter. This August, the STAR collaboration, a group of scientists aiming to deduce the properties of the quark gluon plasma and the physics that underlay them, published their measurement of the vorticity of the quark-gluon plasma in Nature: a experiment which elucidates the unexpected fluid properties of this matter that dominated early in the universe, and is an important step to bettering our theory of the strong force. The STAR collaboration is aiming to discover the properties of our early universe. Researchers like Yale’s Helen Caines don’t need to journey through time to discover properties of early universe. They have only to cross the Long Island Sound to Brookhaven National Laboratory, where the Relativistic Heavy Ion Collider is cooking up the same conditions. At Brookhaven, STAR researchers focus narrow beams of gold ions (atoms which have lost their outer electrons) at one another, each traveling close to the speed of light. Such incredible speeds also give the ions incredible energy, so any head-on collision between gold ions is able to dissolve the 79 protons and 118 neutrons in each gold ion into quarks and gluons, forming, for a brief instant, the quark gluon plasma, a soup of quarks and gluons which exists at extreme temperatures and densities. The Relativistic Heavy Ion Collider, along with CERN’s Large Hadron Collider in Geneva are the only facilities in the world with machines powerful enough to produce quark gluon plasma. Having proven that the produced plasma is indeed comparable to that of the primordial cosmos, scientists in the STAR collaboration moved on to also show that this material is full of unexpected surprises. For example, researchers anticipated that such a hot, energetic state of matter would behave like some sort of super gas, without the strong collectivity properties that characterize liquids, unlike gasses, which diffuse evenly. In actuality, the quark gluon plasma (QGP) behaves like a liquid, since its constituents interact more strongly than those of a gas. “We know that the gluons themselves interact, and the quarks interact via gluons, so it makes sense if they can interact very strongly with each other,” Caines said. It’s not surprising that a medium formed by such extremes of temperature and pressure would also break other records. These record-setting properties include a low viscosity, a high temperature, and a now legendary vorticity, or swirling properties. These measurements not only help us understand this unexpected liquid phase, but also assist in our understanding of quantum chromodynamics (QCD), a theory which governs the interactions of the colored charged particles (quarks and gluons) which make up the QGP. The strong force, which governs the behavior of quarks, is incredibly unusual. Gravity, the force with which we’re most familiar, only attracts objects toward each other. Electromagnetism has positive and negative (anti-positive) charges – but like gravity, their effect fades with the inverse square of the distance. Quarks and gluons have color-charge, which has nothing to do with color but for convenient metaphor. There are three colors (red, green, and blue) and three anti-colors (anti-red, anti-green, anti-blue) Any stable state must be colorless – which can only be achieved by mixing all the colors, like in protons and neutrons (made up of three quarks) – or by combining a color and anti-color, like in particles called mesons (which consist of a quark and an anti-quark). Furthermore, mass and charge are fundamental properties of particles, whereas color charge can change via gluon interactions. It is the strong force, and the color charge that mediates it, that is responsible for the interactions between quarks and gluons. By understanding the behavior of the QGP, scientists are probing these fundamental forces and properties. Try pulling a meson apart and you’ll see that the strong force operates differently in another important way: with increasing distance, it gets increasingly strong, like a spring that wishes to retract. Eventually, so much energy is expended in pulling apart this particle that another particle antiparticle pair is pulled from the vacuum to preserve net colorlessness. This means that it’s impossible to detect free quarks. This might be puzzling, since quarks in the QGP aren’t bound in mesons or nucleons, but zooming in anywhere in this soup, conditions are “locally” colorless. Since scientists can’t detect the quarks individually, the STAR collaboration scientists instead detect the particles created from the QGP as it cools, whose motion is inherited from this fluid that formed them. The QGP is a fluid, and is defined by superlatives. At four trillion degrees Celsius, tens of thousands of degrees hotter than a supernova, it’s the hottest thing we know in the universe. It also has the lowest viscosity, or resistance to flow, of any known fluid. Now, the STAR collaboration has also made the first measurement of its vorticity, or rotation. When gold ions collide head-on, their constituent particles combine to create the QGP; but typically the collision between ions is more glancing. In that case, region of contact, like the center of a Venn diagram, will combine to become QGP, while the outside regions will continue speeding away from each other. These glancing collisions give the resulting soup a net angular momentum, setting the QGP spinning. The experiment used two instruments for this measurement. 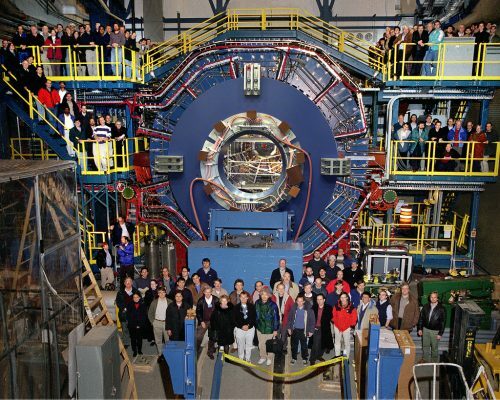 The first of these was the Time Project Chamber, which is filled with gas that surrounds the collision and allows scientists to track the particles released from the collision and therefore generated by the QGP. This detector measures protons created by the plasma. The second instrument, the Beam-Beam Counters, measures deflections in the paths of particles which whiz by one another and indicates the magnitude and direction of angular momentum in each collision. Correlating this measured angular momentum with aligned direction of the detected protons, STAR scientists searched for preference in direction that will indicate the vorticity of the system. This measurement indicates that the QGP is the most vortical fluid known, a measured value surprising in its magnitude. The vorticity of the QGP exceeded all predicted values – whirling faster than tornados, Jupiter’s red spot, and previous vorticity record-holder superfluid helium. This high vorticity is allowed to perpetuate by the low viscosity of the fluid – since high resistance to flow would dampen whirls prior to measurement. Vorticity is a property of the flow – it’s not intrinsic to the medium, but results from the medium and its motion. But since we know the conditions that produced the flow inside of the collider, it’s possible to gain useful information about the fluid properties. Knowing the specifics of the collision that generated it allows us to firm up our theories of how the QGP interacts and responds to forces. Changes in temperature and pressure induce phase transitions. Think briefly of ice: increasing the temperature will turn it to water, then to vapor. At 4 trillion degrees C, the quark gluon plasma is very hot, which is why the strong mutual interactions of of its constituent particles is puzzling. The QGP behaves more like a fluid than like a gas. Instead of expanding out evenly in all directions, it’s preferential in its flow. Is it a relic of the strong force, which governs interactions between its constituent parts? Or perhaps the extreme pressure of the cosmic soup? In future experiments, the STAR collaboration hopes to deduce the equation of state for the quark gluon plasma to resolve these questions and test theories about the strong force. This vorticity measurement will aid in improving theories of the plasma and how it affected the properties of the early universe. Most importantly, spinning charges produce magnetic fields, making this measurement an important first step in making the first measurements of the magnetic properties of the QGP, an important step in better understanding the weird physics surrounding this hot, flowy, whirling soup. Although the significance of such fundamental science isn’t always immediately clear, Yale’s Dr. Li Yi, a scientist with the collaboration sees this as exciting infinite possibility. “Maybe it sounds like science fiction, but in all of the modern world most of the technology is based on QED (quantum electro dynamics), our theory of the electromagnetic force. For example, we transfer the messages and communications through electromagnetic waves – this is all through the QED because we really understand what we can do. QCD we don’t know exactly how it works – or what we could use it for.” The STAR Collaboration’s measurements of the QGP are among the most important measurements for formulating and testing this theory. Sophia Sánchez-Maes is a junior Physics and Astrophysics double major in Timothy Dwight college. She works with Professor Jun Korenaga on studying the origin processes of plate tectonics, and topics in complex systems. The author would like to thank Professor Helen Caines and Dr. Li Yi for their incredible knowledge and willingness to share it.